Cocoa is one of our most important ingredients and is used in many of our foods and beverages. The cocoa supply chain features serious challenges, from low incomes for farmers to child labour and gender inequalities. 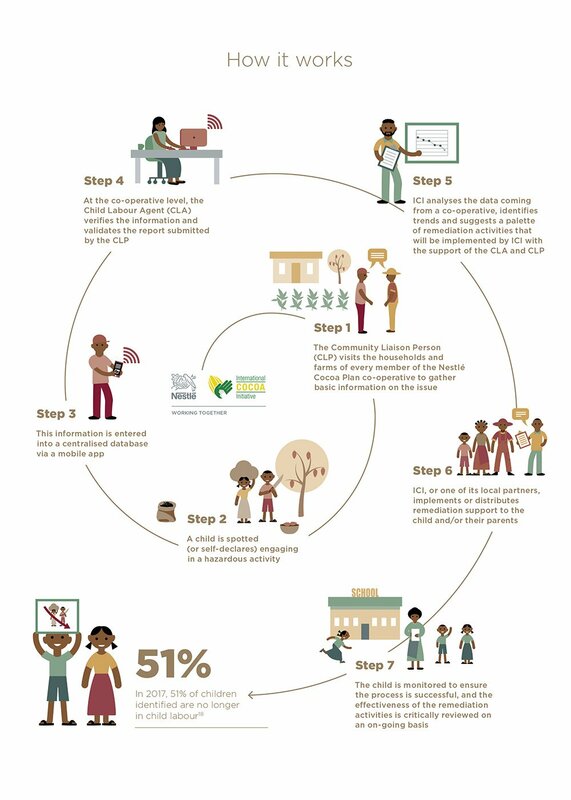 We are tackling these issues through implementing the Nestlé Cocoa Plan in our supply chain. By 2017: Source 150 000 tonnes of cocoa through the Nestlé Cocoa Plan. By 2018: Source 175 000 tonnes of cocoa through the Nestlé Cocoa Plan. By 2020: Source 230 000 tonnes of cocoa through the Nestlé Cocoa Plan. 186 358 tonnes of cocoa sourced through the Nestlé Cocoa Plan in 2017. 42.9% of our total cocoa purchased in 2017 was responsibly sourced. 42.9% of our total cocoa purchased in 2017 was traceable. Tackling Child Labour (pdf, 5 Mb) – our first report on child labour in our cocoa supply chain – published in 2017. The majority of cocoa farmers are smallholders with low productivity and incomes, living in poor communities, with depleted soils and older, less productive trees. They often resort to using their children for tasks that could be harmful to their physical or mental development and are therefore classified as child labour. Women in the cocoa supply chain are often under-rewarded for their work, or not given a voice in their communities. The Nestlé Cocoa Plan’s vision is to improve the lives of farmers in our cocoa supply chain. The Plan is active in the main cocoa-producing countries, with the focus being on the world’s largest sources, Côte d’Ivoire and Ghana. Better cocoa, which covers certification, deforestation and building long-term relationships in our supply chain. Underlying all these activities is transparency and partnerships. In 2017, we continued our work within the World Cocoa Foundation’s CocoaAction, the industry strategy for cocoa sustainability. We developed our relationship with UTZ to extend their work from certification to field key performance indicator (KPI) collection, and formed a partnership with Jacobs Foundation in 2016 to add literacy training to our child labour work. In 2017, we published our first-ever report on child labour in our cocoa supply chain, Tackling Child Labour (pdf, 5 Mb). The report sets out our approach to addressing this significant, complex and sensitive challenge. As well as detailing the work we are doing with the International Cocoa Initiative to identify the causes of child labour and implement solutions, it marks a major step forward in our efforts to deal with the challenge. The table below shows key information about our work to address this issue, and further information can be found in the report. Our Child Labour Monitoring and Remediation System (CLMRS) is fully active in the Nestlé Cocoa Plan in Côte d’Ivoire and is being rolled out in Ghana. The assistance includes supporting activities that improve farmers’ incomes, and activities to help children return to or start school, including the provision of school kits and birth certificates. In particular, we have partnered with the Jacobs Foundation to improve education in deprived communities and ensure children are learning basic literacy and maths skills in community schools. This has so far benefited 837 children. 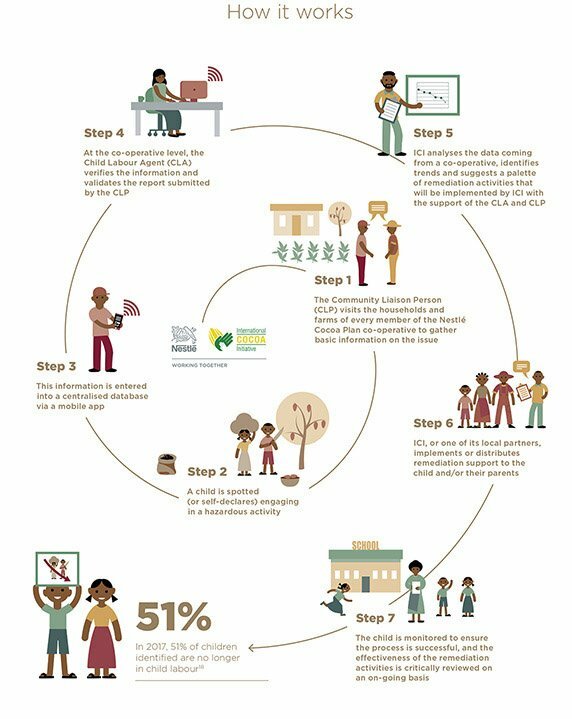 The system’s effectiveness was highlighted in an evaluation survey, which showed that in cooperatives where the system was set up between 2013 and 2015 a reduction in child labour of 51% was seen. The CLMRS is only sustainable if the farmer organisations can continue to drive the work using the premium they receive from the cocoa. Ensuring this transfer of responsibility is a particular challenge and a focus of our efforts. The FLA continued its annual auditing of our Côte d’Ivoire supply chain, and its most recent report can be found on the FLA website. Child labour is also found in our vanilla supply chain, often the result of the labour-intensive nature of vanilla harvesting. We are working with growers and key partners to address this and provide remedies, such as better access to schools. Click here to see our cocoa commitment (pdf, 12Mb). You can also find more information on the Communities performance data page (pdf, 12Mb), and in our Nestlé in Society report.